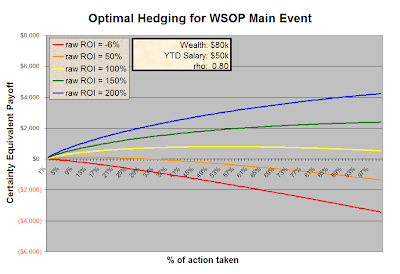 Quantitative Poker: WSOP Utility Analysis revisited, part 2: How many shares should a WSOP Main Event player sell off? WSOP Utility Analysis revisited, part 2: How many shares should a WSOP Main Event player sell off? Last time, we looked at the relationship between a player's expected utility in the 2010 World Series of Poker Main Event and his skill advantage over the field. 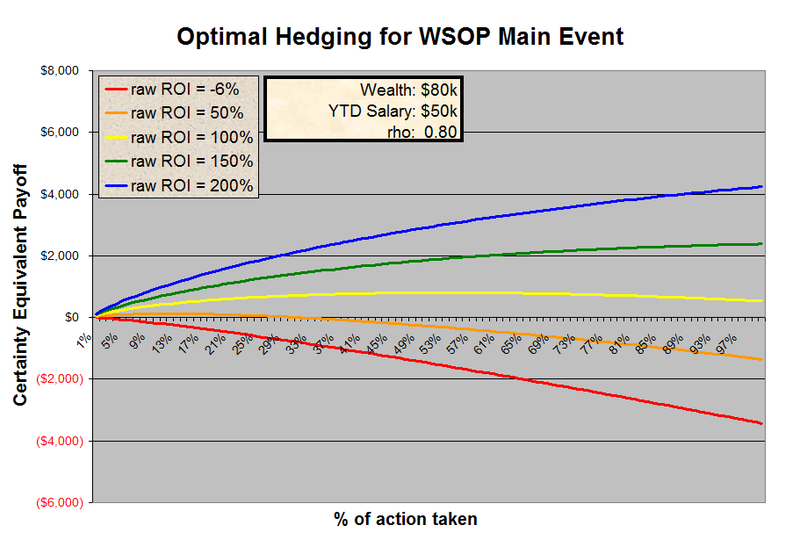 Under a particular proposed shape of finish probability distribution, we found that a raw ROI of about 86% (i.e. an average cash of $18,600) was necessary for a player with a typical income, risk aversion, and tax obligation to simply break even in terms of expected utility. Even in a juicy WSOP Main Event field, this is a pretty lofty goal for most, and many near-average players will be forced out of participating on their own dime unless they are willing to effectively pay for the privilege. Fortunately, backing and staking agreements are common for large-field poker tournaments. 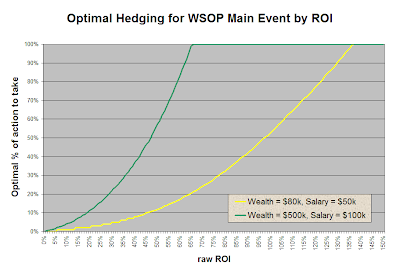 Much as the stock market investor would never put a large portion of his capital into a single investment unless it were extraordinarily profitable, the poker player (who "invests in himself" in his poker career) will often benefit from diversifying away some of his risk by hedging his tournament results out to others. If these mediocre winning players players are able to find other parties to put up part of their entry fee in exchange for part of their prize, they will be able to yield a positive expected utility in the event, not only for themselves, but also for their investors. For the purposes of this analysis, we assume that only option of staking/backing available to the player is to sell off X% of his prize in exchange for X% of the cost of entry (selling shares at 1-to-1, with no markup). The result for the player of such a contract will be the same as if the entire tournament were scaled down by X%. A player can sell off 90% of himself to effectively make the WSOP Main Event a $1,000 buyin tournament for him, with prizes which are exactly proportional to those of the true main event. Selling shares at a price other than 100% of face value — If a player with a significant skill edge wanted to sell pieces of his action, in reality, he sould expect to get much better than 1-to-1 from his investors, since he's the one doing the work. The investors would still be left with a very profitable, fast, hands-free investment. Conversely, a -EV player might still be able to gain some expected utility by selling pieces of himself at a discount. Direct backing — One popular form of contract is for the investor to provide all of the player's entry fee in exchange for a payoff equal to a fixed percentage of the player's profit in the event that he cashes. This is a freeroll for the player and will thus always yield him a positive expected utility, and it can still provide the investor with a positive expected utility as well if the player is sufficiently skilled. It is reasonable to expect that this sort of deal may be more favorable than selling shares at face value if the player is very skilled, but also very risk-averse relative to the stakes of the event. Long-term, ongoing backing agreements — Some players have professional backers with whom they enter into long-term deals. The investor pays all of the player's buyins for a series of tournaments in exchange for a percentage of the player's profits, but if the player is already at a net negative from previous tournaments, he must repay that amount to the backer in full before being able to realize any profits from the contract. These agreements have several variables and would be complicated to analyze, and players under such agreements may not have the opportunity to consider other hedging options anyway, since they are often locked into their contracts until they expire. For now, we consider only the simplest case: shares sold at face value. Given this opportunity to rescale the stakes of the tournament, assuming that there is an investor willing to buy any amount of shares that the player would offer, how much should the player look to sell off? Here, the different colored lines represent different several different levels of skill edge, expressed in terms of raw ROI. The horizontal axis shows the percentage of his own action that the player takes; the amount he sells off is equal to 100% minus this number. In red — For the player of precisely average skill, who has a raw ROI of -6% (due to rake), we see that, regardless of the number of shares he sells, he cannot realize a profitable opportunity in this event. Since he's a break-even player and is risk-averse and experiences tax effects that are negative on average, he's going to lose utility by playing any poker tournament, regardless of how small he makes the stakes. In orange — When he was forced to take all of his own action, we recall that the small winner (raw ROI of 50%) was forced out of being able to profit from his small skill advantage at all. We showed that the minimum ROI required for a positive expected utility is 86%, and the chart verifies that if this 50% ROI player were to take all of his own action, he would be losing money after taxes and risk aversion. By selling shares, we see that he can realize a small positive expected utility ($121 in certainty equivalent) by playing for about 12% of his own action. The ability to hedge against the entry fee has allowed the skilled, risk-averse player to realize a profitable opportunity where he otherwise could not. In yellow — This solid winning player (raw ROI of 100%) is a strong enough player that he will realize a positive expected utility even if he takes all of his own action, as we can see by the yellow curve being completely above the x-axis. However, we see that this player will realize an even higher expected utility by selling off some of his action than by paying his own way entirely. He'll improve his certainty equivalent payoff from $532 to $805 by selling off roughly half of his action. 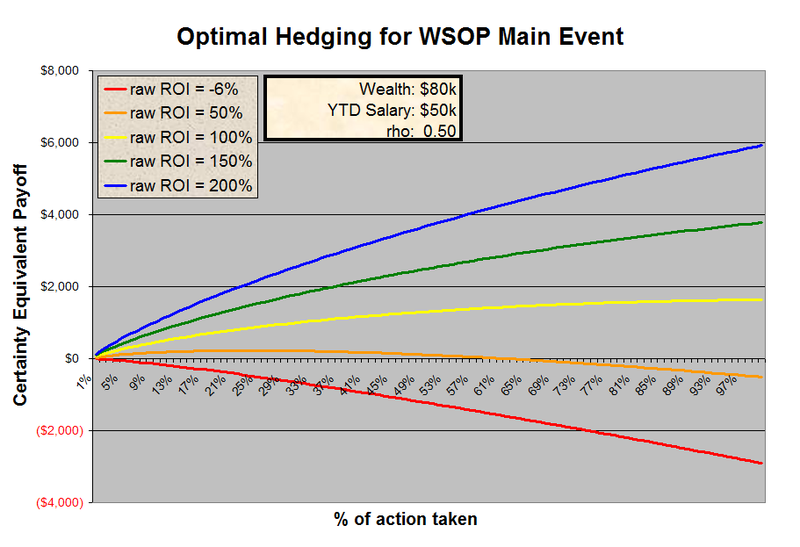 In green — A bigger winner (raw ROI of 150%) turns out to do best by playing for all 100% of his own action. The investment has become so profitable that even a risk-averse individual does best by taking it all on and not hedging it out to others. 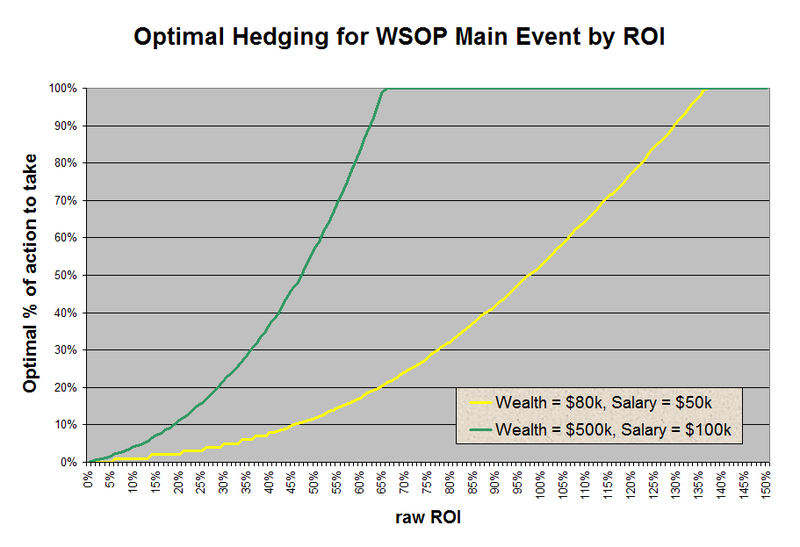 In blue — This big winner (raw ROI of 200%) has similar results to the green player above. The breakeven player is, of course, still unable to profit, and it turns out the 50% ROI player still benefits slightly from selling off some of his action, but overall, the additional risk tolerance incentivizes this player to hold onto all or most of his own action. The nature of the effects is similar. It is worthy to note that the orange curve (raw ROI of 50%) is similar to that of the original analysis for the more risk-averse player, suggesting that a small winner with an average wealth should still be selling off most of his action regardless of his personal preferences for risk. On the other hand, it looks like the yellow curve (raw ROI of 100%) has become roughly the point where the player will prefer to take 100% of his own action for this particular level of risk aversion, so players with significant skill edges should be more inclined to take all of their own action if they have a higher tolerance for risk. Thanks to the complexity of the utility function and the sheer number of different payoffs, there is no simple way to express a formula for the curves we've found above. In order to calculate the optimal hedging percentages (i.e. the percentages of action to take which correspond to the maximum points of these curves), we proceed numerically. Rather than only considering five different specific values, this chart looks at every possible value of raw ROI and provides a more comprehensive practical resource. As we've seen earlier, a player with an ROI less than 0% does best by playing for 0% of his own action, i.e. not playing at all, unless some misinformed or charitable investor were to give him a full stake. For players with positive ROI, we see that there is always some positive percentage of his own action that produces a better profit than not playing at all. The optimal percentage of his own action that the player should take seems to increase in a convex way; as the player increases his skill edge over the field, the optimal percentage that he should keep increases faster at higher values of ROI. For both the typical player and the wealthy player, there is a "ceiling" level of minimum ROI at which the player should take all of his own action. We see that this is about 136% for the typical player and about 66% for the wealthy player. This analysis was done for the 2010 WSOP Main Event. Most other tournaments (likely including the 2011 WSOP Main Event) have much smaller fields, and, accordingly, have less skewed payoffs and have less extreme utility annihilation effects. 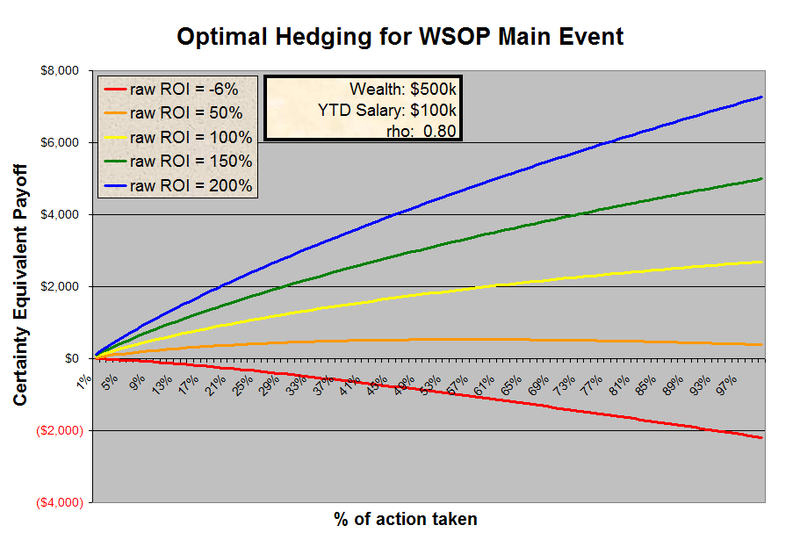 So, for a $10k tournament with a smaller field, the optimal percentage of one's own action to keep will increase, and the guidelines in this post can be used as a lower bound to this. Similarly, for tournaments with buyins less than $10k, the optimal percentage of one's own action to keep will increase, and for tournaments with buyins greater than $10k, the optimal percentage of one's own action to keep will decrease. In these cases, the guidelines in this post can be used as an upper/lower bound. Note that every aspect of this analysis holds just as true for the person making the investment as it does for the person doing the playing. If a player and his investor(s) all have roughly the same wealth and utility, then each of them will be doing best by taking on the recommended optimal percentage of the player's action as recommended by this model. For example, when the player has a 100% ROI and wants to maximize the total utility among himself and his investor, the parties will both roughly optimize their expected utility by the player keeping 50% of his action while one investor takes the other 50%. In the case of the 50% ROI player, he would take about 12% of his own action while selling off equal pieces of about 12% each to 7 different outside investors. In reality, players can't know their exact ROI in any given tournament. The best that players can do is form something resembling a maximum likelihood estimate based on their assessment of their own ability, the expected field strength of the tournament, and the tournament struture. This could be modeled as a random variable with some uncertainty (likely Gaussian) about the point estimate. That is, if your best guess of your ROI is 50%, a more accurate implementation would involve your ROI being an unknown random variable with mean 50% and some nonzero standard deviation. Close inspection of the first chart shows that the distance between the ROI curves seems to get smaller as ROI gets higher, which means that, in the face of an uncertain ROI, it's best to "round down" a little for the purposes of plugging a fixed ROI into this model. For example, if you estimate your ROI is about 50% but have a lot of uncertainty about this estimate, you will probably get a slightly more accurate result by using something like 45% in these guidelines. Let me know if you'd like to see me add the considerations of other types of staking and backing contracts to this model. And, as was the case with my risky site bankroll management model, this is a model with many specific variables (wealth, income, risk preferences, ROI, tournament field size, tournament payout distribution) that would ideally all be tailored to each specific player and each specific tournament on a case-by-case basis. This is a model that should be of tremendous practical value to all tournament players, so if there is enough interest, I might clean up my spreadsheet and make it publicly available in the future. You might also want to consider the utility-positive effects of swapping or buying pieces of other players in lieu of taking more of yourself. In most cases, where you say things like "take all your own action," a more utility-maximizing thing to do is to continue to sell pieces of yourself while buying appropriately sized pieces of others, even others who have smaller EV than you (we discussed this briefly in our book). ^^ is jankenman, no patience to figure out how to make my name appear. Very true, one would always be better off swapping some percentage of one's recommended equity through this model rather than taking it all themselves. That would be a good next step in this sort of approach, though it's probably computationally annoying... one shortcut would come from the fact that the Sharpe-optimizing swap percentages are independent of scale, i.e. they'd be the same if you were taking all $10,000 of the action of the pooled players or if you were to sell off any percentage of that portfolio. So, if the pool of available players to possibly swap with or buy from is fixed, first calculate the optimal percentage-swapping arrangement, then approximate a payoff distribution for that player portfolio (which will be of a lower variance than the single player's finish distribution built here) and run this sort of approach on the result.